Several species of teleost fishes and invertebrates are exploited in estuarine ecosystems and adjacent coastal waters. In these environments, the crustaceans catches represents one of the most important groups exploited by global fisheries, being considered a source of food and income for coastal communities (FAO, 2018). In this sense, blue crabs (Callinectes spp.) are a relevant fisheries resources due its wide distribution and abundance in shallow waters of tropical and subtropical regions around the world, being mainly exploraited by the artisanal fishing through some fishing gears like crab traps and longlines (Bunnel et al., 2010; Anderson et al., 2011; Barletta et al., 2017; Mancinelli et al., 2017; Ruas et al., 2017). Crab traps may have different geometric shapes being provided by one or more openings for the blue crabs entrance and a frame made of steel or Poly-Vinyl Chloride (PVC) covered by multifilament polyamide with five centimeters of mesh opening between opposing nodes. On the upper or lateral side of the crab trap, there is an opening to remove the blue crabs caught. Additionally, pieces of bony fishes (natural baits) are allocated inner the fishing gears to attract the blue crabs (Bannwart, 2014). 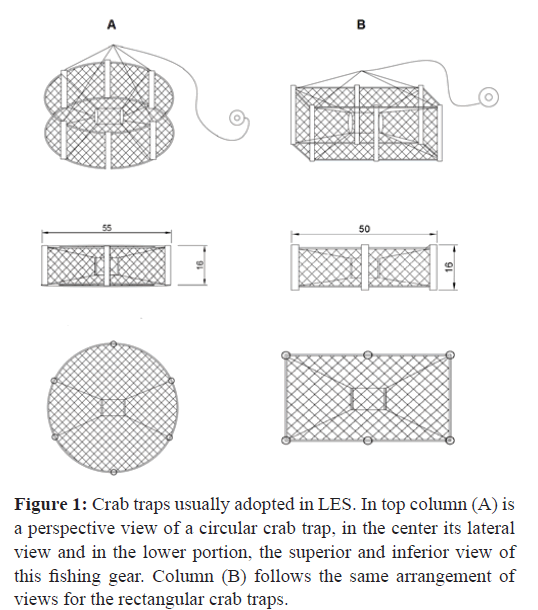 Two crab trap typologies are adopted in artisanal fisheries in Brazil: (I) rectangular and (II) circular traps (Bannwart, 2014). Empirically, artisanal fishermen report that the success in this fishing method is close affected by the typology of the crab traps. Additionally, they report that in shallow waters regions surrounded by hills, the wind direction regimes can also affect the fishing productivity. However, these empirical observations do not have any academic verification, and there are no efforts to measure the catchability potential of the crab traps in coastal lagoons located in South America. Considering the relevance of this subject and the lack of efforts to valuate the catchability potential of a crab traps, the present study analysed the performance of circular and rectangular traps in a blue crab fishing ground located in a South American coastal lagoon. To evaluate the crab traps performances, a total of 40 sampling efforts, including 20 with a rectangular trap and 20 with a circular traps along 20 fishing trials were conducted in the Laguna Estuarine Complex (LEC) located in southern Brazil (study area coordinates -48°46’W and -28o30’S; mud substrata; approximately 2 m depth) during the spring season. The study region is formed by the Santo Antonio dos Anjos, Imaruí, and Mirim lagoons (18400 ha). More details about LEC abiotic factors can be found in Barletta et al. (2017). Each lagoon is linked to the other by small channels, and the water flows to the sea through a single channel (for the map of the area see Marques, 2011). The estuary is located in a strip of coastal plains, and it is a typical choked lagoon, where the salinity ecocline is formed by the connection between the sea and the Santo Antonio dos Anjos Lagoon. The estuary receives freshwater from the Tubarão and Duna River basins which discharges directly in the LEC (Barletta et al., 2017). The traps were allocated close one each other (distance lower than 5 m) at the fishing ground using a rowing fishing boat close to 6:00 PM and collected at 7:00 AM, totalling 13 hours per fishing campaign. This time interval was chosen because it is usually adopted by local fishermen. At the same direction, we adopt the same baits in the fishing gears: mullets (Mugil spp.) and atlantic bonito (Sarda sarda). Crab traps are a passive fishing gear with PVC and galvanized steel structure and covered by multifilament polyamide with 5 cm of mesh opening between opposing nodes. A long polypropylene cable with styrofoam is tied to the top panel to facility the fishing gear identification on the water surface. Finally, natural baits are allocated in the crab trap to attract the blue crabs into the fishing gear (Table 1 and Figure 1). In this study, the two main crab traps models (circular and rectangular traps) to blue crabs (Callinectes spp.) catches in LEC were designed and manufactured based on the dimensions usually adopted by local fishermen. Table 1: General description of crab traps in LES. Figure 1:Crab traps usually adopted in LES. In top column (A) i s a perspective view of a circular crab trap, in the center its lateral view and in the lower portion, the superior and inferior view of this fishing gear. Column (B) follows the same arrangement of views for the rectangular crab traps. The blue crabs caught were identified (Melo, 1996), measured (total carapace length and weight) and classified by gender (males and females). Using the dataset obtained above we performed a Mann-Whitney test (Lehmann, 2006) over the biomass caught to identify possible differences into the catches between the fishing campaigns. Moreover, considering that the fishing ground is a shallow coastal lagoon (1.4 m) partially sheltered from the influence of estuarine currents (Barletta et al., 2017), we evaluate the possible effects of the local wind directions over the catch fluctuations in rectangular and circular crab traps. In shallow coastal lagoons (such as our study region), usually we have lentic environments in the most of time (O'Sullivan and Reynolds, 2004). However, wind regimes can impact the water circulation of these aquatic systems, provoking temporary alterations in local hydrodynamical patterns (O'Sullivan and Reynolds, 2004). Thus, the wind direction can affect the crab traps position, moving and/ or turn these gears in the fishing ground. The daily wind information for the period were obtained from in situ station of the Centro de Informações sobre Recursos Ambientais e Hidrometeorologia de Santa Catarina (CIRAMEPAGRI) located approximately 22 km from the fishing ground where the catch efforts were performed in this study. To evaluate the influence of the wind over the catch oscillations its directional field was divided in quadrants as follows: Q1-north to east (0-90°), Q2-east to south (90-180°), Q3-south to west (180-270°) and, finally, Q4-west to north (270°-360°). This approach was adopt to consider all wind directions variations observed in study area (more details in Truccolo, 2011). The catches by crab trap shape (circular and rectangular) were compared by wind quadrants by Mann-Whitney test (Lehmann, 2006), in order to evaluate the influence of this environmental variable over the fishing productivity/fishing gear. After twenty fishing campaigns were caught 502 blue crabs (30.41 kg) for three distinct species: Callinectes danae (327), Callinectes sapidus (167) and Callinectes exasperatus (8). Comparably, circular crab traps showed a largest biomass caught than rectangular crab traps (19.63 kg and 13.78 kg, respectively). Notably, 71.6% of catch composition in circular crab traps were Callinectes danae, followed by 27.3% of Callinectes sapidus and 0.3% of Callinectes exasperatus. Similar patterns were observed in rectangular crab traps once Callinectes danae represented 54.08% of total catches, followed by 42.3% and 3.5% of Callinectes sapidus and Callinectes exasperatus, respectively (Figure 2). Figure 2:Distribution of blue crabs species caught by crab traps. The mean length of Callinectes spp. caught by treatments were 10.06 cm and 9.7 cm in rectangular and circular crab traps, respectively. The minimum and maximum length for rectangular crab traps were 6 cm and 14 cm, while for the circular crab traps were 6.6 cm and 15 cm. According to Pereira et al. (2009), the L50 values for Callinectes danae, studied in Babitonga Bay (Santa Catarina state), is 8.6 cm, while for Callinectes sapidus is 10.2 cm. In this sense, it is possible to observe that just 18.6% of blue crabs caught were below of L50 (length at which 50% of the blue crabs are mature) (Figure 3). Considering that Callinectes exasperatus caught less than 5% of total catches between the crab traps, this specie was dropped from analysis. 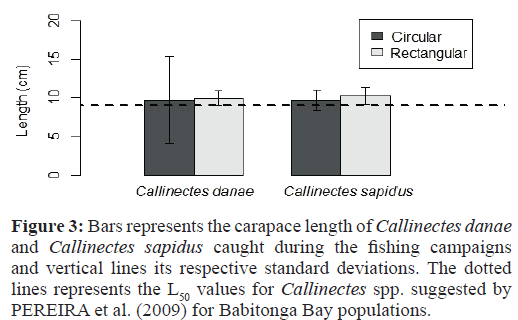 Figure 3:Bars represents the carapace length of Callinectes danae and Callinectes sapidus caught during the fishing campaigns and vertical lines its respective standard deviations. The dotted lines represents the L50 values for Callinectes spp. suggested by PEREIRA et al. (2009) for Babitonga Bay populations. 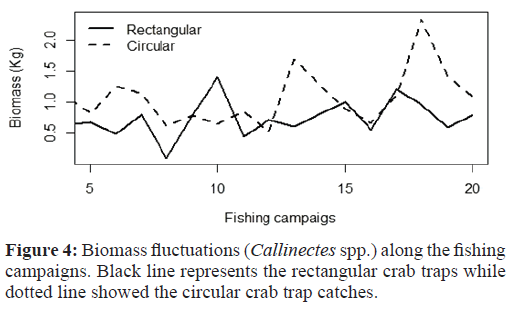 During the twenty fishing campaigns were possible to observe the predominance of Callinectes danae into the crab traps with significant oscillation of biomass caught (kg) per campaign, suggesting the influence of wind regimes over the catch fluctuations (Figure 4). In this sense, considering that LEC has a very shallow waters (1-2 m) the literature suggest that its dynamics is strongly influenced by local wind (Barletta et al., 2017). However, wind speed (magnitude) data did not showed a significant variations between the fishing campaigns (average=3 ms-1 and standand variation=0.8 ms-1). Possibly, this pattern is related to the fact that in situ efforts were focused just in spring season. In the other hand, considering the directional quadrants of the wind, it was possible to observe considerable variation between the dates of the fishing campaigns (Table 2). Table 2: Wind quadrants distribution along the fishing campaigns. It is possible to observe that the distribution of the wind directional was similar in Q1 (06), Q2 (07) and Q3 (07). There were no occurrences of Q4 in our study region. Figure 4:Biomass fluctuations (Callinectes spp.) along the fishing campaigns. Black line represents the rectangular crab traps while dotted line showed the circular crab trap catches. Fishing campaigns under Q1 regimes obtained the highest total biomasses caught (rectangular crab traps=5.2 kg and circular crab traps=7.4 kg). The blue crabs under Q2 influence generated 4.1 kg of crab traps in rectangular crab traps and 5.2 kg in circular crab traps. Finally, crab traps under Q3 regimes caught 4.5 kg and 6.9 kg of Callinectes spp. in rectangular and circular fishing gears, respectively. There were no catches under Q4 regime. The Spearman correlation showed a close correlation between the blue crab biomass caught/wind quadrant, mainly in circular crab traps once the values were: Q1=0.57; Q2=0.16; Q3=0.62. In rectangular crab traps, the correlations between the Quadrants (Q) and catches were: Q1=0.50; Q2=0.20 and Q3=0.48. The Mann-Whitney test (monocaudal with 5% of significance) showed that there was a significant difference between the biomass caught in circular and rectangular crab traps, showing the highest fishing potential of the first geometry mentioned (U-calculated=107). Analyzing five years of daily wind information from in situ station of the CIRAM-EPAGRI we did not observe any events of wind came from Q4 quadrant. Thus, just Q1, Q2, and Q3 were considered for analysis in our study. During the fishing campaigns, circular crab traps showed better catch efficiency than rectangular crab traps. Considering that both fishing gears has the same number (and dimensions) of entries and mesh size, probably the shape design and total area affects the blue crabs assimilation. According to Fuverik and Lokkeborg (1994), the shape of passive fishing gears is one of the most important variable related to the catch success. In this sense, several studies have been evaluating the fishing gear geometry impacts over the fishing effort (Guillory and Hein, 1998; Butcher et al., 2012; Favaro et al., 2013; Brown et al., 2015; Serena et al., 2016). However, these authors did not adopt crab traps with similar dimensions and same mesh panel being difficult to identify the characteristic responsible for different catch rates. In this sense, in the present study the fishing gears dimensions are very close and it was adopt the same material for structure and panels and just the crab trap geometry was distinct between the fishing gears. The highest biomass in circular crab traps probably are related to its stability on the bottom. In some fishing campaigns, it was possible to observe the rectangular crab traps turned due the wind influence over the local water circulation. This fact can contribute to blue crabs escape after its catches. Additionally, the noise caused by the irregular movements of the rectangular crab traps at the fishing ground can reduce the catch probability of blue crabs. Most of blue crabs caught were above L50 that suggest the high selectivity of this fishing gear. This fact is directly associate with the mesh opening adopt by local fishermen (5 cm) that allows just the adult stock be catch. In previous study, Guillory and Hein (1998) showed that the mesh size and its typology in crab traps are two most important variables to ensure the fishing effort just over the blue crabs above L50. During Q1 and Q3 quadrants, were observed an expressive biomass caught in comparison to Q2 quadrant. Analyzing remote sensing data, more specifically Landsat 5 data (band 4) over the digital elevation model (DEM) from Shuttle Radar Topography Mission (SRTM) it is possible to observe that the study area (see "white star" in Figure 5) is protected from Q1 and Q3 wind quadrants (see "dotted lines" in Figure 5). In the other hand, during Q2 situations, wind regimes can reach directly on the water surface of coastal lagoon due the hills absence in this quadrant. Although the wind incidence over the water be fundamentally relevant for oxygen balance and nutrient flows, this variable also be negative effects increasing the local hydrodynamics circulation (Powell and Stelle, 1995). Under these conditions (Q2), usually local fisheries resources looking for shelter close to bottom and fisheries catches presents a significant reduction (Powell and Stelle, 1995). 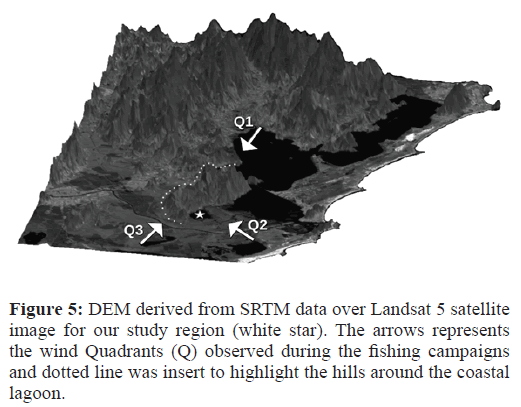 Figure 5:DEM derived from SRTM data over Landsat 5 satellite image for our study region (white star). The arrows represents the wind Quadrants (Q) observed during the fishing campaigns and dotted line was insert to highlight the hills around the coastal lagoon. Based on the results, it was possible to qualify the influence of wind direction over the crab traps catches in neotropical regions. Additionally, it was possible to evaluate the geometry influence of these fishing gears over the catch rates in its fishing grounds. Although the study case designed has a simple approach, this represents a pioneer effort to better understand the crab trap fishing catch rates variability over different wind regimes in artisanal fishing in neotropical coastal lagoons. The majority of blue crabs caught were above L50 in both fishing gears geometry suggesting that the open meshes adopt are coherent with the selectivity premises independent of the quadrant (Q) evaluated. In this sense, probably the hills around the fishing ground affects the local circulation and water turbulence, once, during Q1 and Q3 campaigns we observed the highest catch rates. Considering the relevance of artisanal fishing for coastal communities along neotropical regions and the lack of information about the environmental-fishing gear typology over the catch rates we suggest new efforts to support future fishing management strategies. This study is funded by the Grupo de Gestão, Ecologia e Tecnologia Marinha (GTMar) from the Departamento de Engenharia de Pesca e Ciências Biológicas, Universidade do Estado de Santa Catarina (UDESC–Campus Laguna) (NPP2015020002570). Moreover, we are grateful to the CIRAMEPAGRI to provide the wind in situ data used in this study. Anderson, S.C., Mills, F.J., Watson, R., Lotze H.K. (2011) Rapid Global Expansion of Invertebrate Fisheries: Trends, Drivers, and Ecosystem Effects. Plos One 6, e14735. Barletta, M., Lima, A.R.A., Dantas, D.V., Oliveira, I.M., Reis-Neto, J., et al. (2017) How can accurate landing stats help designing better fisheries and environmental management for Western Atlantic Estuaries? In: Finkl, C.W., Makowski, C. Coastal Wetlands: Alteration and Remediation (2ed) Dordrecht: Springer Nature, pp: 631-703. Bannwart, J.P. (2014) A pesca artesanal marinha em Santa Catarina. Epagri - Boletim Didático, Florianópolis. Bunnel, D.B., Lipton, D.W., Miller, T.J. (2010) The Bioeconomic Impact of Different Management Regulations on the Chesapeake Bay Blue Crab Fishery. N Am J Fish Manag 30, 1505-1521. Brown, P., Hunt, T., Giri, K. (2015) Effects of gear type, entrance size and soak time on trap efficiency for freshwater crayfish Cherax destructor and C. albidus. Mar Freshw Res 66, 989-998. Butcher, P.A., Leland, J.C., Broadhurst, M.K., Paterson, B.D., Mayer, D.G., (2012) Giant mud crab (Scylla serrata): relative efficiencies of common baited traps and impacts on discards. ICES J Mar Sci 69, 1511-1522. FAO (2018) The State of World Fisheries and Aquaculture 2018-Meeting the sustainable development goals. Food and Agriculture Organization of the United Nations (FAO), Rome. Favaro, B., Duff, S.D., Côté I. (2013) A trap with a twist: evaluating a bycatch reduction device to prevent rockfish capture in crustacean traps. ICES J Mar Sci 70, 114-122. Furevik, D.M., Løkkerborg, S. (1994) Fishing trials in Norway for torsk (Brosme brosme) and cod (Gadus morhua) using baited commercial pots. Fish Res 19, 219-229. Guillory, V., Heiin, S. (1998) A review and evaluation of escape rings in blue crab traps. J Shellfish Res 17, 551-559. Lehmann, E.L. (1998) Nonparametrics: Statistical methods based on ranks. Springer, New York. Mancinelli, G., Chainho, P., Cilenti, L., Falco, S., Kapiris, K., et al. (2017) On the Atlantic blue crab (Callinectes sapidus Rathbun 1896) in southern European coastal waters: Time to turn a threat into a resource? Fisheries Res 194, 1-8. Marques, J.S., Müller, I.C., Moser, J.R., Sincero, T.C. and Marques, M.R.F. (2011) Wild captured crab, Chasmagnathus granulata (Dana, 1851), a new host for white spot syndrome virus (WSSV). Aquaculture 318, 20-24. Melo G.A.S. (1996) Manual of identification of brachyura (crabs and crabs) of the Brazilian coast, Foundation for Research Support of the State of São Paulo in São Paulo. O'Sullivan, P., Reynolds, C.S. (2004) The Lakes Handbook: Limnology and Limnetic Ecology, Wiley-Blackwell, New Jersey 1. Pereira, M.J., Branco, J.O., Christoffersen, M.L., Junior, F.F., Fracasso, H.A.A., et al. (2009) Population biology of Callinectes danae and Callinectes sapidus (Crustacea: Brachyura: Portunidae) in the South-western Atlantic. J Mar Biol Assoc 89, 1-11. Powell, T.M., Stelle, J. H. (Eds.) (1995) Ecological time series. Springer, Dordrecht. Ruas, V.M., Becker, C., D'Incao, F. (2017) Evaluation of the Blue Crab Callinectes sapidus Rathbun, 1896 Bycatch in Artisanal Fisheries in Southern Brazil. Braz Arch Biol Technol 60. Serena, M., Grant, T.R., Williams, G.A. (2016) Reducing bycatch mortality in crustacean traps: Effect of trap design on platypus and yabby retention rates. Fish Res 175, 43-50. Truccolo, E.C. (2011) Assessment of the wind behaviour in the northern coast of Santa Catarina. Revista Brasileira de Meterologia 26, 451-460.